50 foot Loops of Heavy Duty Galvanized 6 Strand, 18 Gauge Guy Wire. Perfect for Guying Down All Telescopic and Heavy Duty Antenna Mast Load Applications. Multiple 50 foot Units Ordered can Come in Contiguous Footage up to 1000 Foot. Note: When Selecting Guy Wire for use inguying Antenna Masts, Consider the Height, Antenna Size and Wind Loading being presented. 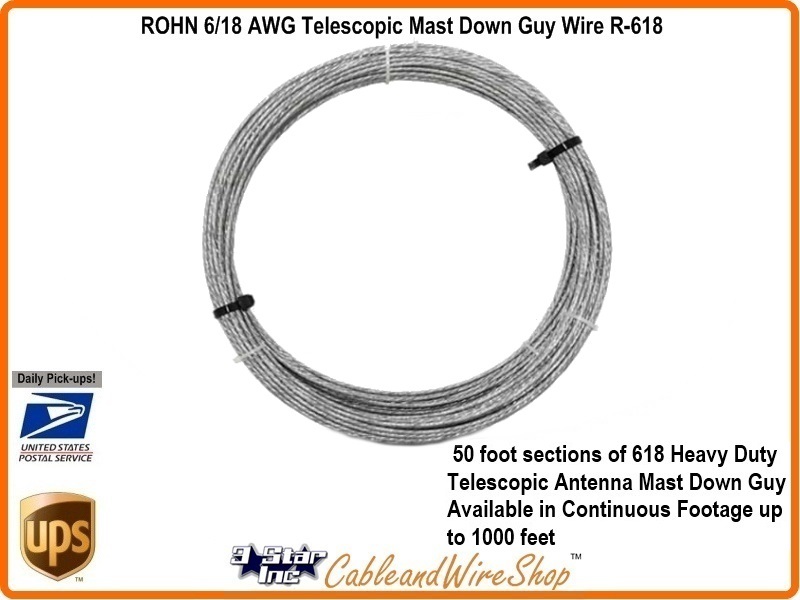 This Stranded (6 Strands of 18 Gauge wire) Guy Wire is Just fine for All Telescopic Antenna Mast Guying Scenarios of Any Height and Wind Load Applications. Make Sure that the Anchor Points are just as Heavy Duty as this Stranded Guy Wire! Federal Spec FF-T-791B Type 1 Form 1; Forged, Hot Dip Glavanized, Open Body, Working Load Limit: 1200 lbs., Ultimate Strength: 6000 lbs.